This page is run by a fan, for the fans. If you are wanting to know more about Gregory Peck, this is definitely the place to be. Want to interact with other fans? Again, this is the hot spot. So, take a cue from Greg as pictured above. Take a seat, and enjoy! To begin, click either on Greg, or the entrance below. 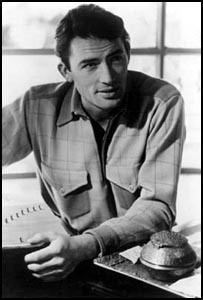 Eldred Gregory Peck, April 5, 1916 - June 12, 2003. See News for information on the life of this great man. Please see News for a special notice. Update on site status in News. DISCLAIMER: I don't want to infringe on any copyrights. So if you see an image here that you know is copyrighted, please let me know as I will quickly take it down. Thanks!